Simon has settled nicely in Montreal, and tells me he is living the dream. Well how hard can it be in Montreal! I am hoping he is doing some work, although the attractions of Rue Sainte Denis are apparently quite compelling, from what I understand. Here he is (to your left in the black sweater) with his friends in his dorm, they are all doing something or another with their fingers. Well anyway, back to gaming. Iannick (the infamous Archiduc Charles of Clash of Empires) and myself played 3 games. Iannick hosted 2 games; both Napoleonic and I hosted 1 game at my hotel, our first WWII effort. We had a great time and both Napleonic games were played using Black Powder. Although a great set of rules, we really made quite a few errors in both games, this did not however diminish the fun. Iannick has posted the first game on his blog, a refight of La Haie Sainte using my figures and terrain pieces on his beautiful new terrain table. A closely fought game, but victory to Iannick, I had the Germans and they did lose historically......... We also played a beautiful looking game with a scenario taken from the BP rulebook (Iannick somehow or another ended up having some Austrians). I truly got trounced in this game. The figures and terrain were Iannick's, and I blame my loss on this. I suspect some photos will soon appear on his blog. Our middle game was the WWII game. We used the Rapid Fire rules and for a first go, we actually did pretty well with them. The book is really the best rulebook (ever better then Lasalle) I have read. Really quite clear rules and beautifully laid out. We did make a couple of errors in respect to morale and some of the cover bonuses, but for our first go at an era and a ruleset, it did go quite well. 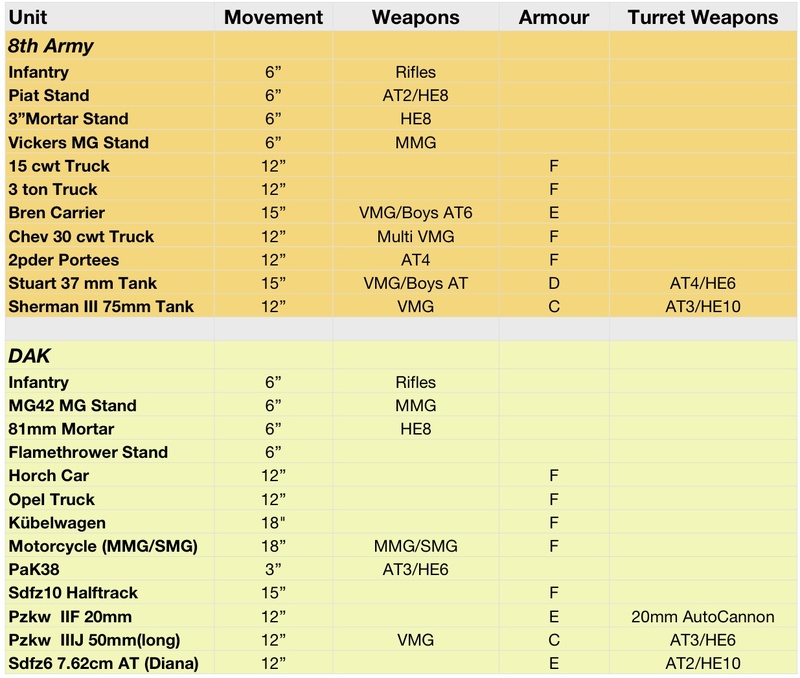 and the all important Vehicle/Gun chart for the game (double click and they get readable). We use blinds to set up the game with only the LRDG on the table. One third of the blinds were dummies to add a little suspense. Certainly more important for the DAK (Iannick). It was a bit of a challenge to set a game up in an hotel room, but it did look pretty good. Here is Iannick very carefully laying his trap. The game started in the early morning, here we can see the sun rise from the DAK position. The LRDG rapidly advanced in order to spot the DAK positions. The 8th Army led with their tanks and AFV's with their infantry in close support. The DAK were well protected by barbed wire and a hidden minefield. Here we can see the the dug in PaK 38's, causing much damage to the advancing 8th Army armour. The British infantry decided that to send their infantry over the hills, in order to flank the DAK position. The Cheval Blanc appears to be shedding some light. 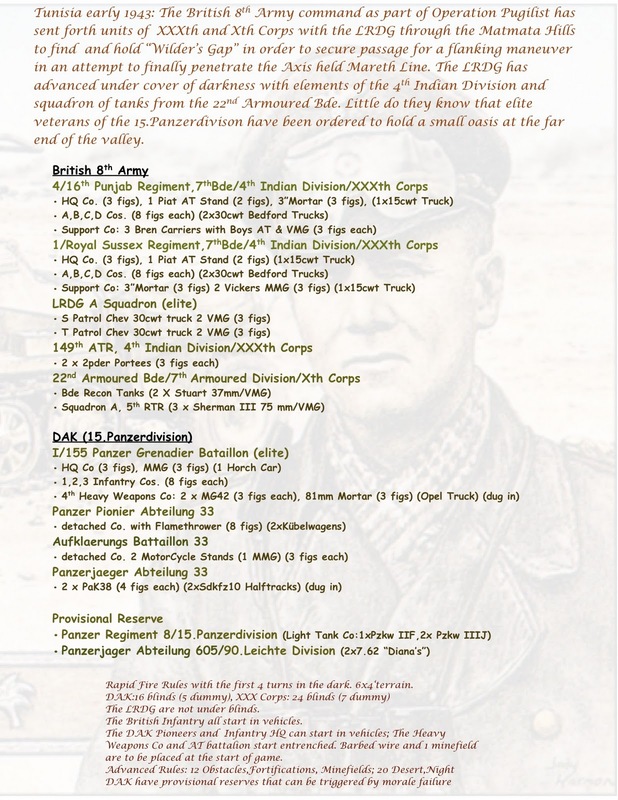 The DAK reserves, a panzer light tank company advance to hold off the British. 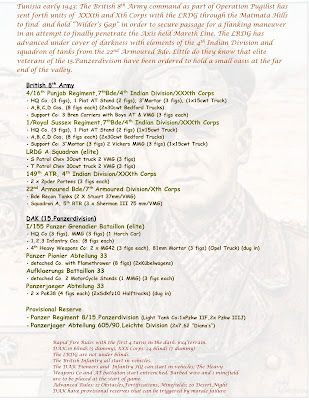 The Punjabis (I always wanted some Punjabis) advance to the barbwire and the allied AFV's breach the DAK lines. These last two photos are unfortunately a little blurred. Turn 12 and game over, the DAK have not routed but they have very few resources left. Well it was not at all a bad game and Iannick graciously gave me a marginal victory. I really should have defined the victory conditions a bit more clearly, I also believe that if we would have applied the morale rules a little more accurately, he would have got his reserves on the table a little earlier. I quite enjoyed the WWII gaming, but I do miss the colour! Well I have been doing some painting, and should have a few Prussians battalions to show soon, but more about that in my next post. Great looking battle, respect for pulling it off in a hotel room! yes that pause was too long - good to see you back, nice looking games. Great looking game, John! I'm amazed you managed to cram all of that into your hotel room. With your Napoleonics you must have had ALOT of luggage! Great looking game, you've even got lighting effects!!! Nice to see you back bloggind again. Great looking game John - welcome back! Your son is a lucky chap - the Montreal I remember was a pretty amazing and beautiful city. Nice to see you back! Oh my gosh college! My son will be heading off there in less than two years! I'm sure the photo of your son was taken during a meeting of his study group while they were taking a short break from the books and doing hand stretches to alleviate muscle cramping from all the notes they are taking. Well, that's what I'd keep telling myself. I like the shots of the game in the hotel room - well done in creating a transportable man cave! Thanks everyone, Hopefully some Napoleonic posts soon. It was a challenge to bring the gaming stuff to Montreal as I also had to transport all my son's stuff including TV's and playstations etc, in a little Volvo C30! Really it seems a very fruitful trip! I can imagine the face of the hotel employees if they watching you with the figures! good to the end result of all that work - I've only played a modified set of Rapid Fire. Interesting to hear the rules are so well written.